So i have a a form That i use for employees in the copany to submit error reports when out on a job. The form takes basic info but also allows you to upload a picture of the issue at hand (when display on a mobile device the upload button actually activates the camera which is cool). 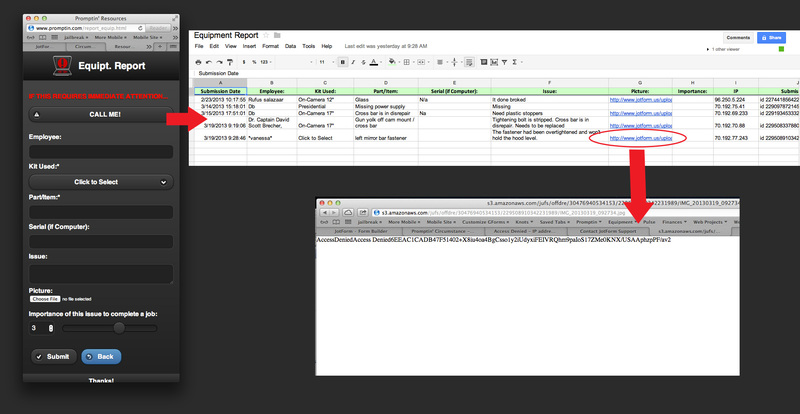 The form is tied to my google drive and will take the submitted info and populate a spreadsheet. Now after i first tested it everything worked. you fill to form out, submit the info and bam it fills out the spreadsheet. A link is populated into the spreadsheet for the photo like this one: http://www.jot...19_092734.jpg (http://www.google.com/url?q=http://www.jotform.us/uploads/offdre/30476940534153/229508910342231989/IMG_20130319_092734.jpg&sa=D&usg=ALhdy28twFg77T4bNQ0eqcSeSuKISIPf-w). Hello, We are really sorry for this inconvenience that you are experiencing but I already answered your questions in your other duplicate thread. Please read them here. Thank you!